The Wakeling Sawing is an updated version of Selbit's original Sawing Through a Woman. Alan Wakeling has added some unique presentation features to his version of this classic illusion. A complete description of the routine can be found in Jim Steinmeyer's book, The Magic of Alan Wakeling. We are pleased to present our version of this fine illusion. As Alan Wakeling performed this illusion, it was a challenge. Members of the audience assist in securing the assistant and moving the boxes. The assistant is first secured at the head and feet with leather cuffs. Attached to each of these is a long leather leash. Each of these is threaded through a hole at each end of a flat table and held by the spectators throughout the performance. Finely finished oak boxes are placed over the secured assistant. The assistant is visible through doors in the front of each box. These doors are closed and swords and steel blades are pushed through the box. Finally, the spectators pull the two boxes apart from each other. The halves are then placed back together and the boxes removed from the table. The assistant is still in her original secured position, but completely restored. The apparatus supplied for this illusion has been designed as a piece of fine furniture. Both dark and natural oak have been used to provide a beautiful and deceptive design. 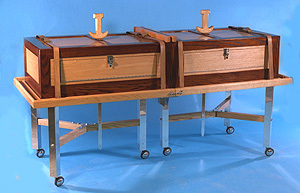 A special stand is also supplied to hold the boxes, swords, and chromed steel blades. The leg braces are made to fold, providing a more efficient method of packing.